SPRINGFIELD, Illinois (March 10, 2016) — Illinois farmland sold Wednesday for prices reaching as high as $13,879 per acre, as more than 200 people jammed into the Knights of Columbus Hall in Springfield for a Murray Wise Associates auction. 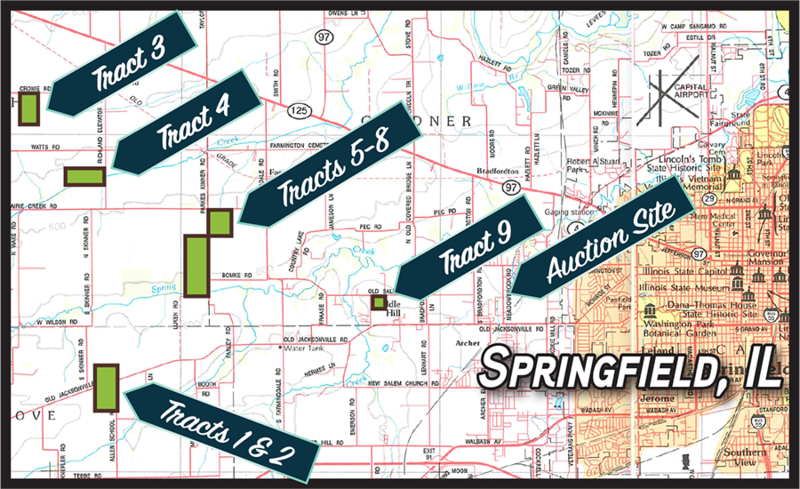 The auction of 775 acres of high-quality Sangamon County land brought a total of $9,037,000, or $11,661 per acre, according to Joe Bubon, president of the auction company. “Investors and operators alike are willing to look past current commodity prices and act on the long-term value of good land,” he said. “We had both farmers and investors competing vigorously for this land, and ultimately, the nine tracts of land were divided among seven bidders. Interest was widespread, with a number of large investors from other areas bidding. This level of competition pushed prices higher than we’ve seen in a while. We had a 107-acre tract go for $13,879, and an 80-acre tract sold for $13,313 per acre,” said Bubon. A tract of 109 acres sold for $12,798 per acre. The company’s next event will be the auction of 313 acres of land in Macon County, Illinois. Individuals interested in additional information may visit www.murraywiseassociates.com or call 800-607-6888.